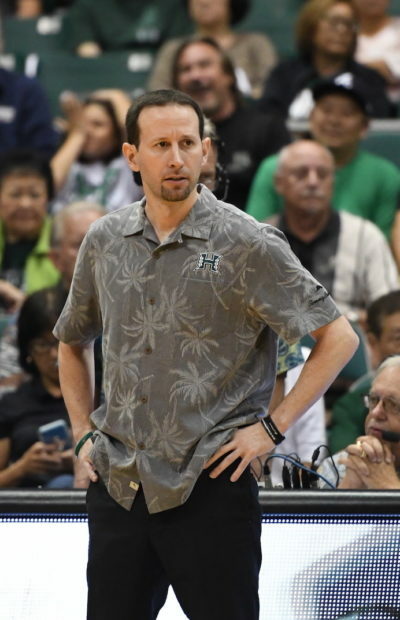 The University of Hawai’i basketball team has some catching up to do. The Rainbow Warriors will have a good chance to do it on the road this week. After going 2-2 during a four-game homestand that was completed last weekend, the Warriors will hit the road for a pair of crucial Big West Conference contests in the Southern California area later this week. Hawai’i is 13-8 overall and tied for fourth place in the Big West at 4-3. The Warriors will play at Long Beach State on Thursday, then at UC Irvine on Saturday. Both games will be available via streaming video from ESPN3 (www.espn3.com or the WatchESPN app). 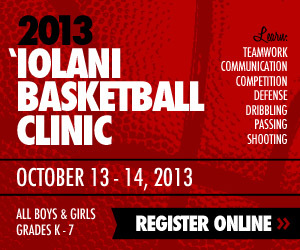 Both games also offer daunting challenges for Hawai’i. Thursday’s game will take place at the Walter Pyramid in Long Beach, Calif. Since joining the Big West Conference in the 2012-13 season, Hawai’i is 0-6 against the 49ers in the Pyramid. It is the only gym/arena in the current Big West that Hawai’i has not won a game in. If anything, this might be the year to do it. For one, the 49ers are down this season. They are currently 8-15 overall and in seventh place in the Big West at 2-5. The scouting report will also be fresh, as the Warriors beat the 49ers, 74-57, last Thursday at the Stan Sheriff Center. Saturday’s game at Irvine, Calif., is also a rematch. The Anteaters rallied to beat the Warriors, 75-74 in overtime, on January 23 at the Sheriff Center. 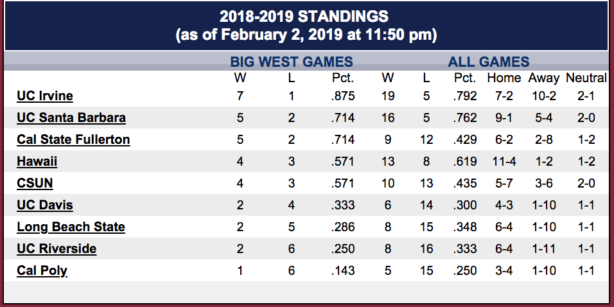 UC Irvine is currently alone atop the Big West at 7-1 (19-5 overall). Can anyone tell me why Owen Holland isn’t seeing any playing time. The little I have seen him he may be the better of the three bigs if given the time and attention he needs. Early on he was hurt. Is this the result of that injury. Can he be red shirted. Can’t believe Brandon Thomas is getting more playing time. BTW I think Justin Hemsley could use more minutes as well. I asked the same question on the Feb 1 post. Don’t think he can red shirt, unless for medical reasons. But he warms up before the game(s), per another forum. He’s the only one not to get into the last two games. Looks like Owen did not go on the road trip, per Brian M.
Potentially best player on the team. More potential Noah Allen. More potential than Janks. I still defer to Ganot and the coaches call on who plays and when. Might want to be reassured that he will be in uniform for the next few years though.